Clematis 'Barbara Dibley' produces stunningly large, red or pale purple-violet flowers with a deeper stripe and red-purple centres during May and June and again in September. 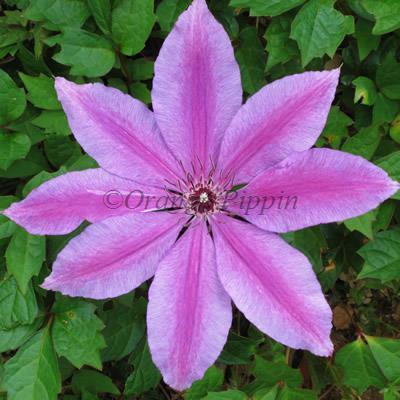 This non-evergreen Clematis can be grown against a trellis, garden fence, wall, arches, pillars, pergolas, clambering over tree stumps and through large shrubs or planted in a container supported by bamboo canes or an obelisk. Clematis 'Barbara Dibley' was raised by Rowland Jackman of George Jackman and Son, England and was named after his secretary.